Twist braids are stylish and versatile way to protect your natural hair. There are so many ways you can wear this trendy look. 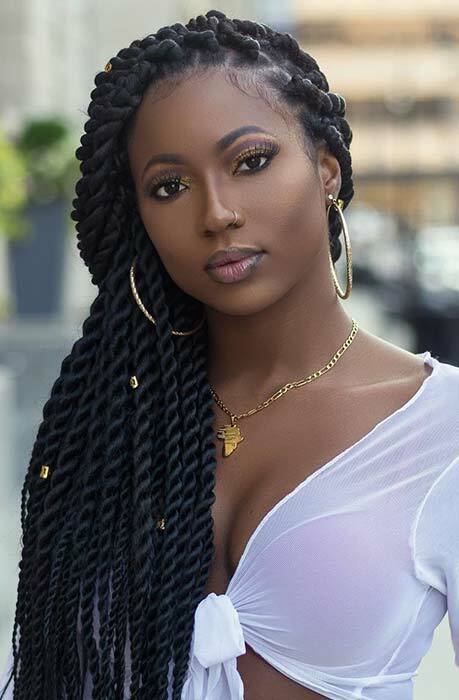 However, with all that choice, it can seem impossible to find your next protective hairstyle, so we are here to help. We have found 23 eye-catching twist braids that you need to try! You will find cute shorter styles, glam twists, updos and more. There are even some fun hair color ideas, too. You won’t be bored with your hair after reading this, you will be booking your next hair salon appointment! Make a statement with red braid twists like these! 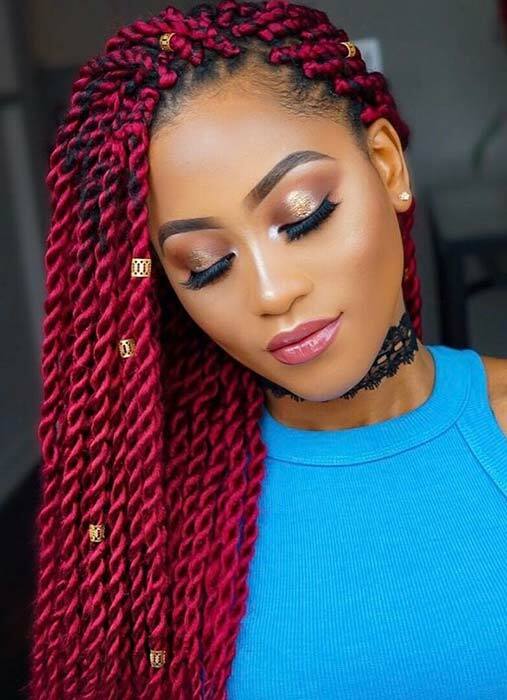 This first hairstyle features long twist braids in a beautiful, bold red shade. You can recreate these or choose one of the many other amazing red tones available. Dark red would be perfect for the fall and winter. Any braid length would look gorgeous in red. Twist braids look beautiful when wrapped into a high bun, just like our next pick. 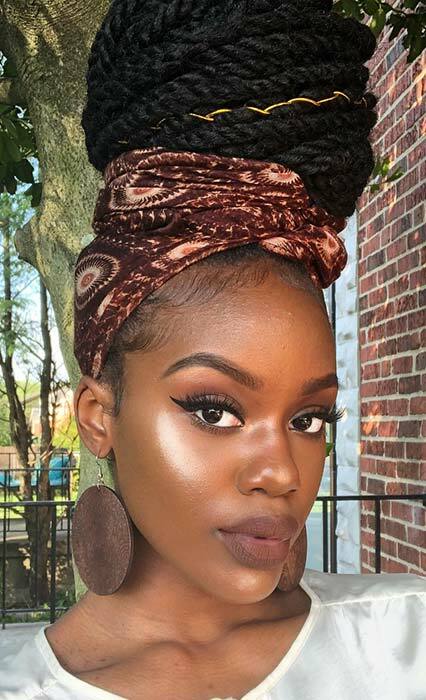 These twists have been styled into a very high bun and have been accessorized with a cute scarf. Scarves are a great accessory for hair as you can use any color and pattern. It is a stylish way to make your hairstyle unique. Shorter hairstyles have become one of the must-have looks. Here is a stylish example! This idea features short, thick twists that create a long bob. It is a chic hairstyle that will suit everyone. You can recreate this or add some funky color. Accessories like hair cuffs would look pretty too. If you are a short hair lover and would like to try this look, we recommend you check out the Dynamite Hair Collection on Instagram. 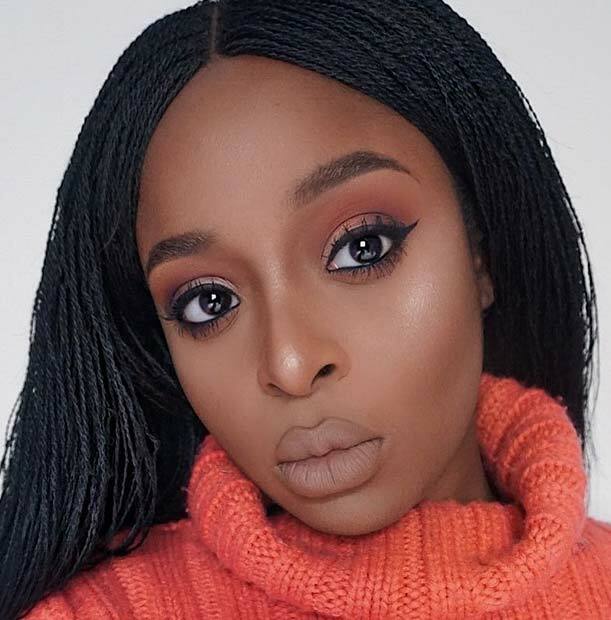 The hair used for this look is 12″ Havana Twists. 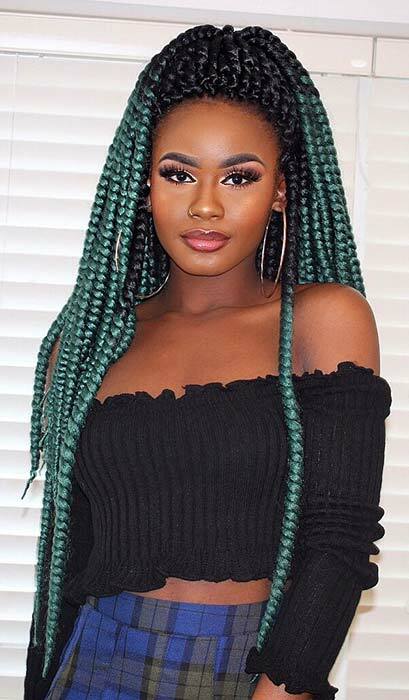 Thinking about adding bold color to your braids? Then you need to check out this next hair idea. 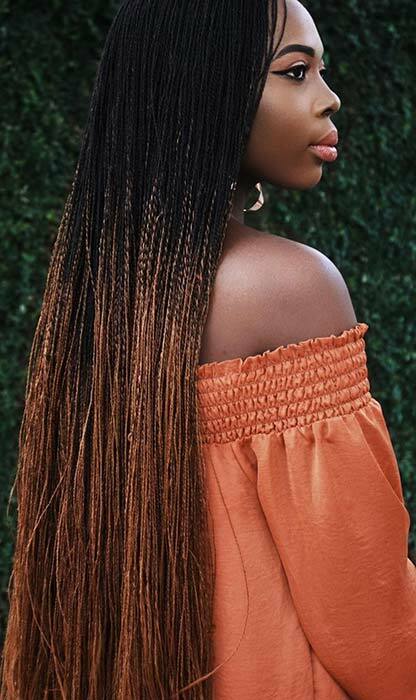 These micro twist braids are long and thin with an ombre look. The hair starts as a dark, natural color at the top and then a beautiful copper shade has been added midway. Recreate the coppery look or try your own bright color. Our next idea features thick twists that have been styled onto the side. Something as simple as sweeping your braids onto one side will instantly give you a chic and elegant look. 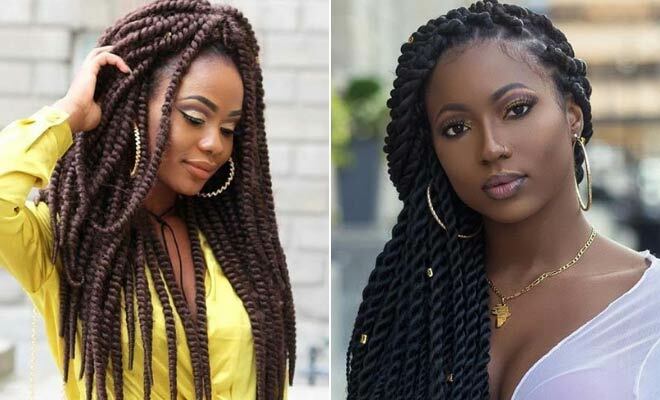 For this, the longer the braids the better, and you can always have the twists created thick or thin, whatever you like the best. Another way you can style your twist braids is in a half-up bun like this. With this style you get the best of both worlds – you can have a gorgeous high bun but also have long, loose braids too. Hair like this looks amazing in any color and you can choose to accessorize with hair cuffs or not. With a bun like this, you cannot go wrong. Next, we have a trendy hair idea to share with you. 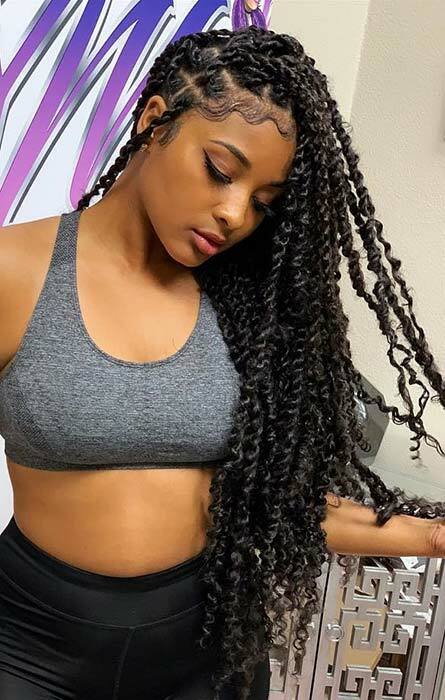 These twist braids are very long and have curls at the end. 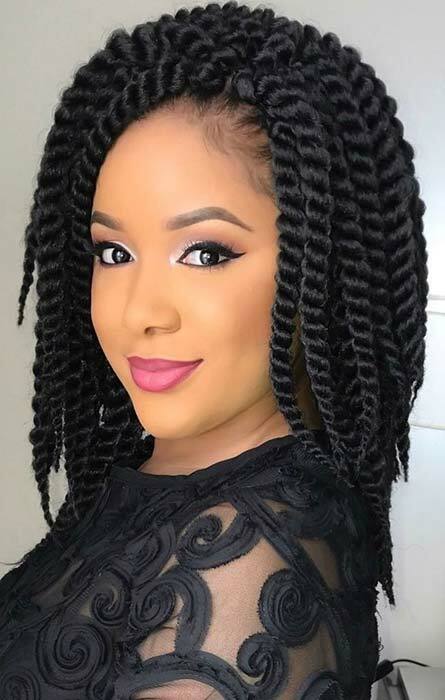 Curls look amazing with twists and it is just a glam way to style the braids. 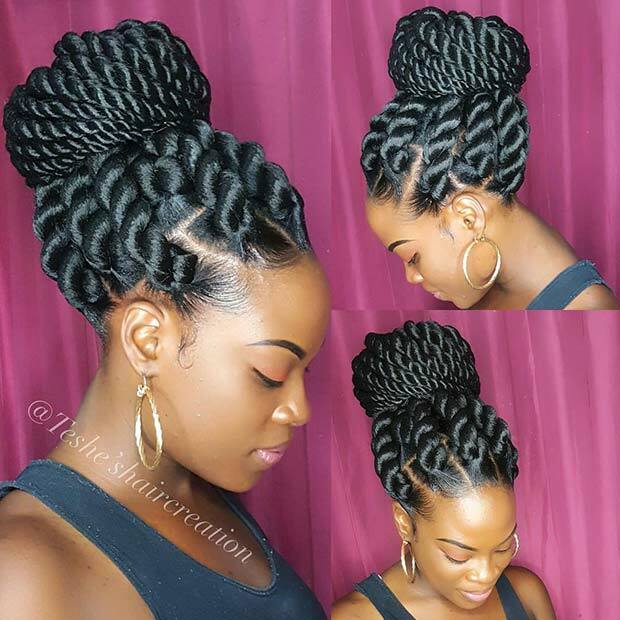 You can recreate long twists like these, or choose a shorter option. Either way, you will look like a goddess! When choosing twist braids you can decide on whether you want chunky or thin braids. Both look gorgeous, but here is a beautiful example of very thin twists. As you can see, the thin twists look so stylish and create a softer and subtler finished result. We love this hair idea! If you do prefer thicker twists, you need to check out this braided bun. For this look, jumbo rope twists have been used. This is a stunning hairstyle that will wow anyone who sees it. 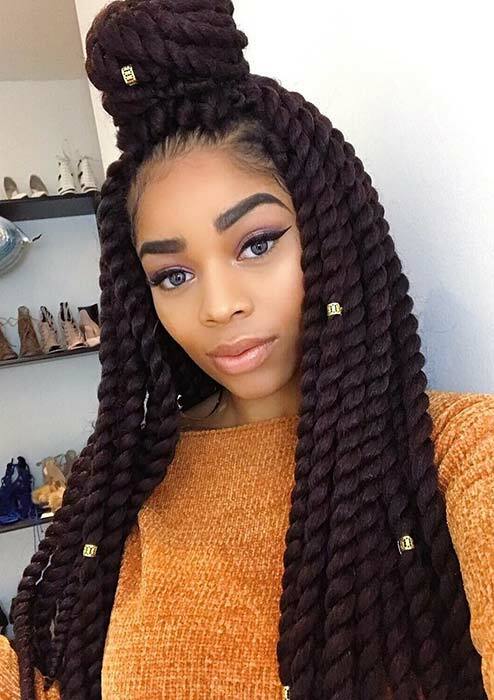 Large braids like these make the rope twists really stand out. Choose a bun like this or leave your braids loose. Mermaid hair is one of the must-have looks! If you love this trend, you may like our next idea. Here we have long twist braids with ombre color. The top of the hair is dark and then a beautiful green shade has been added midway. Hair like this is stylish and magical. Why cant blondes have this hairstyle oris it only for people with fro,s.